The scandal that ruined the political career of Democratic presidential contender Gary Hart was no joke, and yet it was also pretty pathetic. Hart was the clear front runner when he ran for the top office in 1988, but when rumors surfaced of an extramarital affair, he made an offhanded remark during an interview that the press could "follow" him around. Well, they did. And his affair was exposed within days. His candidacy was sunk. Like I said, pathetic, but also fertile ground for biting political satire, and that's what Jason Reitman is aiming for with his new film, The Front Runner. 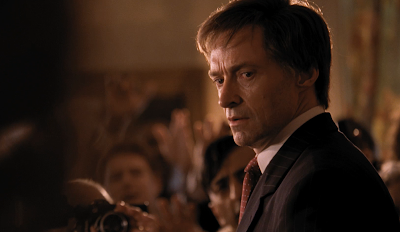 Hugh Jackman takes on the role of Gary Hart, looking and sound like a more convincing politician than Hart ever did, if I'm being honest. The film is based on Matt Bai’s 2014 book All the Truth Is Out: The Week Politics Went Tabloid and will take a look at how the Hart scandal really kickstarted our current 24-hour newscycle where nothing is sacred. Hugh Jackman is set to star in the upcoming biopic “The Front Runner,” about former Senator Gary Hart. Hart served as a U.S. Senator from Colorado from 1975 to 1987, but is most famous for his two bids for the presidency in 1984 and 1988. During the latter primary campaign, he was considered the frontrunner, far ahead of eventual candidate Mike Dukakis, but his momentum became hobbled by accusations in the media of an extramarital affair. Hart famously challenged the media to, “Follow me around. I don’t care. I’m serious. If anybody wants to put a tail on me, go ahead. They’ll be very bored.” The tabloids accepted the challenge, and photographs of Hart with a woman named Donna Rice aboard a yacht brought a swift end to his candidacy. The Front Runner opens November 7th.